NOTE: If you do not have a login with our court, you MUST successfully complete the Creditor Focused or Debtor Focused training and become an e-filer with us BEFORE taking this training. If you wish to initiate an adversary proceeding/complaint electronically, additional training is required. Please click here to begin the process. This process can take up to 48 hours to complete. Realize You Made a Mistake/Need Help? Court notices that would be mailed to multiple locations can be routed to a centralized electronic address. For more information and to register for this service, please go to http://ebn.uscourts.gov. You may also contact EBN Customer Service at 1-877- 837-3424 or ebn@baesystems.com. 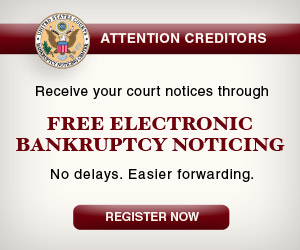 Note: If you are an attorney who already receives your notices via CM/ECF Notice of Electronic Filing, then you do not need to register for this service. For PACER information, please contact the PACER Servicing Center at 800-676-6856.